Polarization in astronomy just became easier to measure. Here’s an exciting application of PolarCam technology for astronomical polarization measurements. Measuring polarization of solar emissions, especially of the corona has been a challenge in astronomy since the highly polarized state of the corona was observed in the 1800’s. But another polarization event in planetary sciences needs further observation to solve its mysteries: the polarization of clouds of Jupiter. In a recent application of measuring polarization in astronomy, 4D Technology mounted a custom micropolarizer array to a thermoelectric cooled, 4 Megapixel Finger Lakes camera. 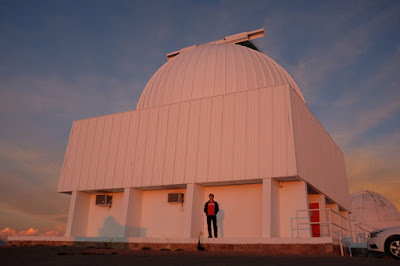 The polarimeter collects images in the 1-meter Cerro Tololo Inter-American Observatory telescope in Chile, shown above. 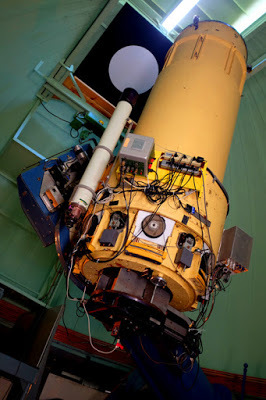 The camera is visible at the base of the telescope in the image below. Mr. Vorobiev trained the telescope and sensor on Jupiter and captured impressive polarization images. He observed and quantified a strong Degree of Linear Polarization signal at the poles of the planet. Proposed theories for such a strong polarization signal at the poles include a different composition of atmospheric particles at this region, and the presence of methane ice crystals. 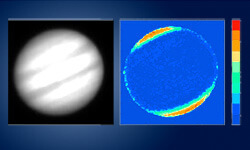 A strong Degree of Linear Polarization (DoLP) at Jupiter’s poles as imaged by micropolarizer camera technology. All images courtesy of Dmitry Vorobiev, Rochester Institute of Technology. The micropolarizer array has become an essential tool for imaging polarization in astronomy. “New snapshot polarimetric cameras allow, for the first time, routine polarimetric measurements,” declared Mr. Vorobiev. The technology, which is at the heart of 4D PolarCam snapshot micropolarizer cameras, enables image enhancement for applications ranging from astronomy to birefringence measurement, industrial monitoring, polarization microscopy, medical imaging and autonomous vehicle vision. More information about Mr. Voribiev’s research is available at here.